"Turn all of your hangers around in your closet. When you use an outfit, turn only that hanger the right way. In 6 months, purge all unturned clothes." It doesn't quite work for me, though, for a few reasons. I sometimes wear clothes that aren't that flattering and am uncomfortable in them all day. But then they are used and get turned around and never purged. I also have favorites that I wear after they are worn out, mostly when I won't see anyone. But they are annoying, because they are pilled or shrunken or otherwise BAD. Most of all, though, I can't stand having half my hangers backwards! So I tweaked the tip to fit my needs. When you wear a piece of clothing, move it to the front of that category of clothes if it worked or, if it didn't work, put it directly in the Goodwill can (a lined garbage can in my laundry closet). At the end of nine months (because Louisiana summers are long and I might not even touch perfectly nice winter clothes in six months), purge the clothes at the BACK of each category. TIP: Organize your closet by category. 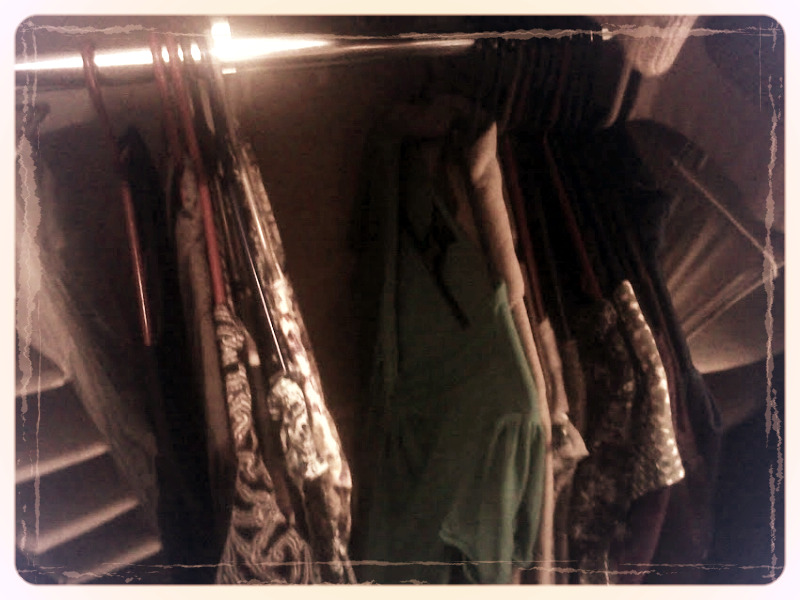 I have pants, long skirts, short skirts, and dresses on one bar of the closet. On the second, I have short sleeved shirts and suits. On the third, I keep long-sleeved shirts, sweaters, and coats. TIP: Put a reminder in your planner every six months to do a Goodwill errand. TIP: Put a reminder in your planner every nine months to purge your closet. Using this rule, I purged 21 items today. Most were t-shirts and long-sleeved t-shirts that shrunk to too short, but there were also clothes that no longer fit my life, like many, many blouses that only look good with suits. I no longer wear suits daily (though I kept three - one for interviews, one for funerals, and my favorite), so I just kept my most treasured, best fitting blouses. The ones I tossed were harsh colors, had dated collars (ruffles were really in when I last worked in an office), and were never quite fitted right (but that didn't matter under a suit jacket). The point of this post, like most of my posts, is NOT that you do this my way. It's that you take all organizing tips with a grain of salt, adopting them for YOUR needs. And if you NEED hangers all in the same direction all the time, that's cool.